I’ve never been able to master knitting but this looks like an interesting take on it that might work for me. LOVE this and LOVE the thought about being able to knit my own sweater. Going to get the craft supplies tomorrow and hopefully will be able to create something as beautiful. Wow, this is just awesome 🙂 I love it! I am all for making my own things, but I have never tried this before. Can’t wait to give it a whirl. How awesome! I wish I could make stuff, but I don’t have the patience. I do buy what other people make though! Welcome to the blogging world. I am new at it too. I have tried to knit o car, but I gave up pretty quickly. The scarf looks beautiful! I never knew that you can knit with your fingers. I love the soft colors of these yarns. You just gave me an idea for a Christmas gift for my wife. She loves scarves!! Ok, you’re inspiring me to try knitting again. It was something that, in the past, I could never quite get good at. I would always start projects and never finish them. Maybe finger knitting is the way to go! I’ve always wanted to learn how to knit. My Nana used to do it and I was always fascinated when I watched her. People who knit simply amaze me! I have tried to knit so many times and I just can’t pick it up. I can crochet though, and I am loving that yarn! Welcome to the world of blogging, I’m new too! Please continue to do your passion! I love crafting blogs and this might help me understand better on how to knit. I have this love and hate relationship with knitting. Those are such cute scarves!! 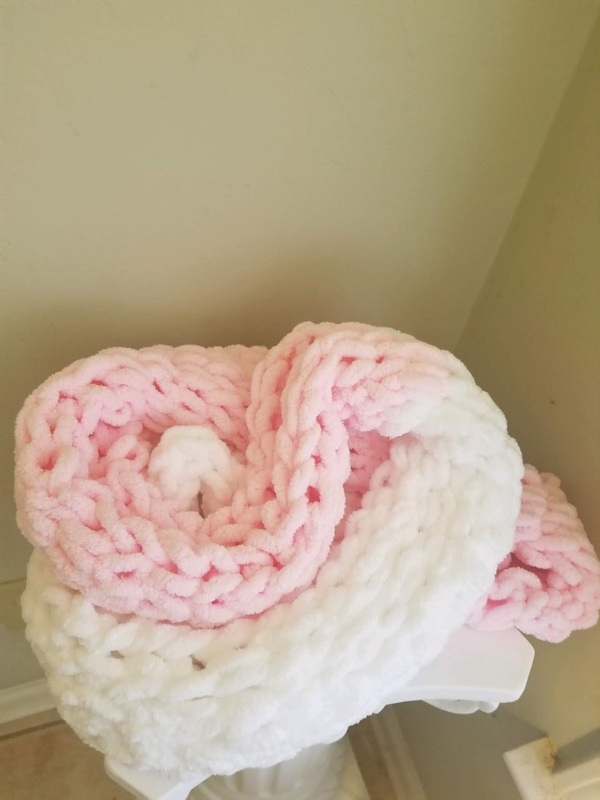 I crochet and always wondered how difficult knitting would be. I am always amazed when I see a knitter and all of their needles!! I love that giant yarn! Thank you for the tutorial. I’ve never been good at knitting. I love knitting and till now, I’ve made bags, socks and mavins. Never thought of knitting a scarf but it is such a great idea. Looks so fine! Now this is a gorgeous looking wool to make scarves with! I bet they are so comfortable and cosy as well. The loop yarn looks so comfy and cosy just as it is. Can I just buy dozens and stuff them into a pillowcase and make a nice big pillow? Surely, they can be enjoyed as is. Your first blog? Welcome! Knitting is definitely a task. My aunt use to knit and she really wanted me to pick it up, but it never interested me. However, my daughter (12) got into if for a few months, but has since stopped. I love that you are wanting to follow in your mother’s footsteps. A nice family tradition. Thank you! Yes I agree. I can’t wait to teach my daughter. She’ll be 5 in December but right now I think it’s too soon for her. Welcome to the blogging world. This is very easy and useful guide to knit scarf. I already taken print out for the same and will send to my sister she loves to do that. Knitting is wonderful. I tend to crochet 🧶. The common thing is the yarn. There is some really awesome yarn out there that can make the difference in your project. Wonderful tutorial! I’ve only ever knit a few items, one of which was a baby blanket for my cousin (she is now 13). My aunt told me how they used that blanket all the time. She gifted the blanket back to me when I had my first baby three years ago and it is still as beautiful as when I first made it. And the memories that come with it, they warm my heart. Hand-knitted projects can be cherished for a lifetime! Keep knitting! I wish I knew how to knit 😀 I envy you! Congratulations on starting your blog and following your crafty passion. I love the yarn color you chose and you make this sound so simple, I think I could do it. I’ve tried knitting when I was in the nesting phase of my pregnancy but I just never mastered it. I’m going to have to try again just reading your post has me thinking about it. I have been crocheting for years- but never have tried finger knitting! I’m going to get some yarn today and give this a try! I wish I have a lot of time so I could try making this on my own. Also, I want to make this for my mom and sister. I need to learn first. Haha, thanks for this! My grandmother makes scarves and tries to teach me and I am so bad at it. This should be helpful, thanks for sharing! Knitting definitely looks easier than crocheting. I will try to follow these steps. Hopefully I can make a scarf! Never considered knitting anything before but it sounds like it could be something handy to do. Cute scarf. this looks a lot of fun to do! a great way to be fashionable and expressing oneself! I think I would love to try it when I got more time in the future! You have written the way but hun for me it is hard. I tried last time but failed miserably. My grandma taught me how to knit and crochet when I was younger but I find that I don’t really have time anymore. I wish someone would make me a thick, long scarf! I love them, but home made is always best! Thanks for sharing!! Congratulations on your foray into blogging. Nice that you are sharing about your skill. Your knitting looks really perfect. Beautiful! Knitting is something that I would like to learn. But for now, I don’t really have the time to study it. Maybe when the kids are older, I can do this as a hobby. I heard knitting can be therapeutic. I’m looking forward to your next post. Who knows I might decide to give it a try. I’ve always been curious on how to do those knitted things, from clothes like scarves, jackets, sweaters, tops… to things that cover phones, gadgets etc. This takes a lot of hard work and discipline to finish! Thanks for showing us the details about this. I might try his one out, set my crafty mind in check, and make a personalized gift this Christmas! I really want to try and make a scarf now!! Thanks for the tips!! KNitting and crochet are two of the do to list i have. i have always wanted to learn how to knit. I tried crochet and sadly, i wasnt too inspired to finish what i have started. Beautiful scarf, you are talented. I haven’t learned knitting. But your post made me think I can start that too. I am so excited to try this! I hope it’s as easy as I thought. 3 hours for a queen size blanket!?!?! This is so much faster than crocheting, but the yarn is a lot thicker, too. I’ll have to try this!